Solar photovoltaic (PV) panels are a versatile energy technology that can help electric customers of all kinds with their electricity needs. There are three main categories of solar panel installation: residential, commercial/industrial, and utility-scale. They primarily differ in size and location, and also are unique in several other system characteristics. Homeowners almost anywhere can benefit from a solar panel installation right on their property. Residential installations are typically rooftop or ground-mounted systems and supply electricity to one property. 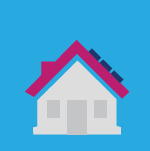 Learn more about residential solar installations. Factory rooftops can be a great place for a solar panel project and are categorized as commercial or industrial installations. 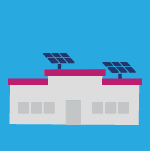 Commercial solar projects supply energy to small businesses, factories, and more. These installations can be a powerful source of savings for companies and corporations. Learn more about commercial and industrial solar installations. Electrical utilities have traditionally generated electricity for the grid using fossil fuels like coal, but they can also provide electrical power to their grid customers with a solar panel installation. Utility-scale solar power plants can be massive, and when combined with storage, can effectively support the power grid. 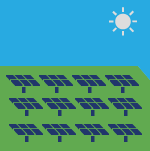 Learn more about utility-scale solar installations.